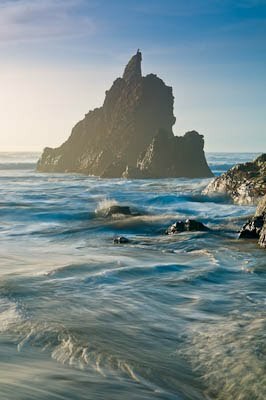 Arcadia Beach, just a short hop south of Cannon Beach, is a wide expanse of sand between Hug Point and a rocky northern partition with a few modest sea stacks. 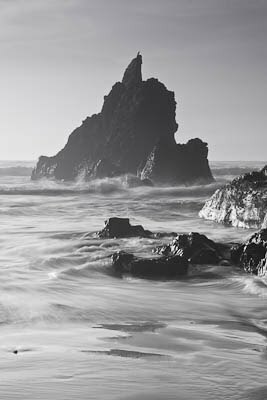 Having walked the beach and taken night photographs there, I wanted to explore the photographic possibilities of the rocks, just a short walk from the parking lot. Waves were running 12-14 ft. offshore, which means a strong and variable wash on the beach. It was a sunny day, with low wind, so, for January, it was quite pleasant. It's a popular spot for folks with kids and dogs, but the possibility of sneaker or rogue waves is always present with strong storms, sometimes thousands of miles away. While the sun was strongly shining at 3:30p, it afforded an opportunity to use a neutral density filter to slow the water down. and capture it's motion. Black and white works well for me in these higher contrast situations. Churning water as the tide resides. 50mm, .6 sec exposure. Near sunset, clouds rolled in from the north, creating some interesting light, but is this going to shut out the glorious sunset we all wait for? 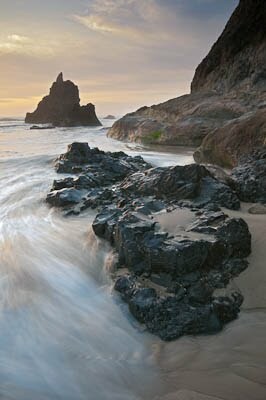 There is a nice contrast here between the black and tan rock formations. There is a black area also on the sea stack. Waves moving in while I shoot with my gum boots on. 14mm, .4 sec. exposure. 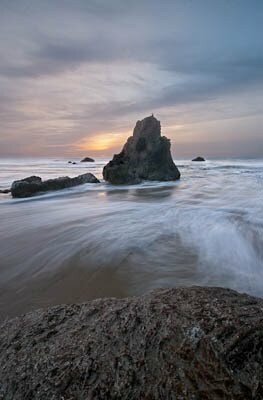 As the sun was veiled a bit, I decided to move up on the rocks to the right. Although the tide had been going out, wave activity was strong, but I was about 8 ft. higher than incoming. In this position, I didn't have my usually planed escape route for large waves, and felt vulnerable. A cormorant perched on the large stack and dried his wings. Waves washing up to the rocks. 6 sec exposure. As the sun and light descended, I decided it was time to go. As I depressed the shutter for the last exposure, suddenly a large wave was heading my way. It was about 7-10 ft. larger than the others, and inundated my position. I held the tripod in place, or it helped to hold me in place. A ghost of the water can be seen in the photo below. It was more excitement than I would ever want. Water came up to the top of my boots. Glad it wasn't any higher! 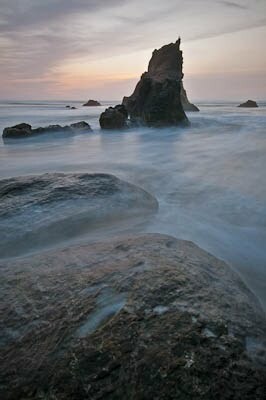 I had spotted another photographer a bit earlier contemplating making a rounding of the rocks from the north. After the wave, I thought about his condition. Shortly afterward, he rounded the rocks. He apparently ran up the beach, but was still hit and wet waist high. His camera bag protected his gear. We were both very fortunate.